Any idea why we are getting this message on all our forms over last few days ? My colleague has let me answer you here as well. Now, I checked the jotforms, but it would be best if you could tell us which jotforms you have seen showing these messages? As soon as we have this information I will open a thread to our developers about it so that they can check it out. Since you say that all jotforms are doing this I have just cleared your form's cache so please try to see if the error is shown again for you. Thank you for letting us know. The two forms above are actually one and the same, but from what I see it seems that the API key that is entered into Stripe payment widget is not OK. Comparing to other jotforms, it seems that the API you are using on the one above is different. 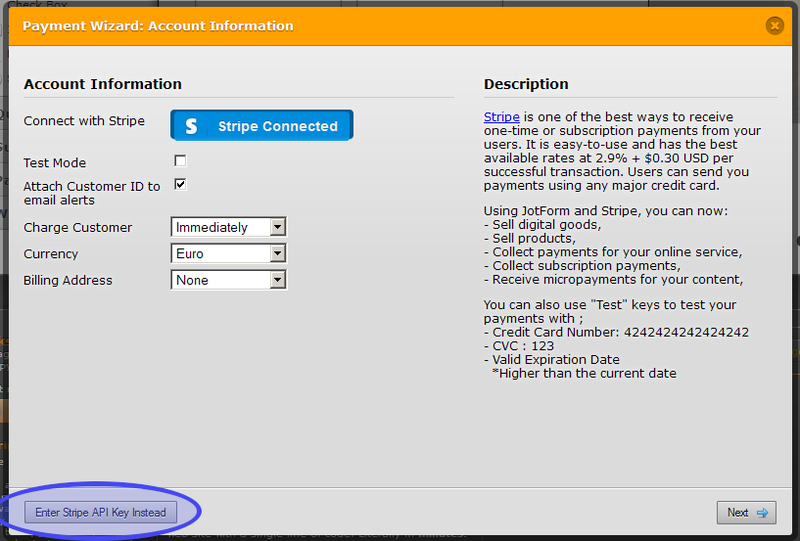 What I would suggest is to go into the widget and click to integrate with Stripe. After this is done, do let us know if you are still experiencing the same issue. I believe that this will fix it, but if not do let us know. To find it please use the Sort option in the right corner by adding the Form ID. In this case that would be 42362475348964. You can also get quickly to it by going here http://www.jotform.com/myforms/42362475348964. The second one seems to be using different keys to connect to Stripe and is working, but the first one is still having the same old key. What I would suggest is to go to the widget and make the connection by manually adding keys, not by using the button at the top. This way you will know if the connection was refused as well as when it is connected. We should have a chat open soon, but you can ask us here as well. This is a different jotform than the others before. Seems that your API keys have changed, so I would suggest following the same steps to manually add the keys to all your jotforms. That way you will have all new keys associated with jotforms and the payments will get accepted.